Steve Salomon took over as Interim City Manager when former City Manager Janet Keeter retired, which happened to be about a month after the Miner Road sinkhole occurred. The city council was so pleased with his performance that last October it offered him the job on a permanent basis, which he accepted with the proviso that he be allowed to work only 90 percent of full time as he commutes from Brentwood. His employment contract provides for the possibility of a raise of up to 3 percent after six months on the job. On March 20 the city council confirmed that Salomon would receive the full 3 percent raise. His performance review was conducted in closed session, and the result was reported to be "superb." 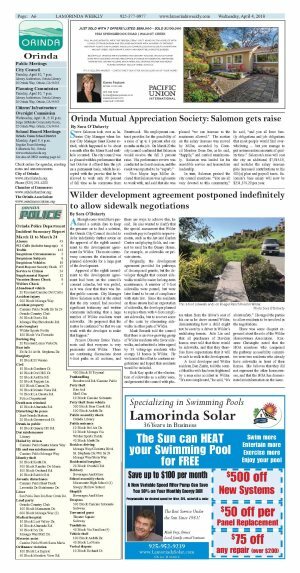 Vice Mayor Inga Miller declared that Salomon was a pleasure to work with, and said that she was pleased "we can increase to the maximum allowed." The motion on the salary increase was moved by Miller, seconded by Council Member Dean Orr, as he said, "happily," and carried unanimously. Salomon was lauded for his incredible service and tremendous leadership. In turn, Salomon praised the city council members. "You are all very devoted to this community," he said, "and you all have family obligations and job obligations that most people would find overwhelming ... but you manage to put in tremendous amounts of quality time." Salomon's raise will cost the city an additional $7,915.19, and includes the salary increase plus increased contributions to his 401(a) plan and payroll taxes. Salomon's base salary will now be $231,379.20 per year.